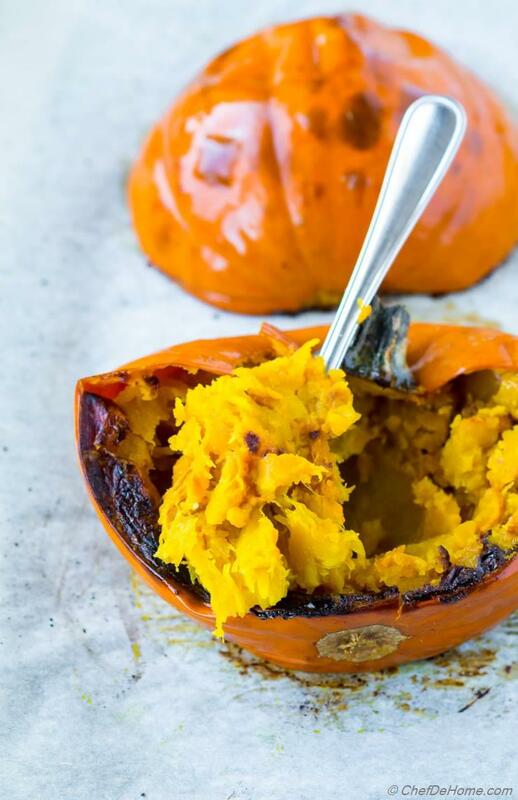 Learn to roast soft, spoon-able, and delicious pumpkin at home. Learn to perfectly roast pumpkin at home, then use it in Thanksgiving pies, cakes, breads, soups, and a lot more. When I plan to Roast Pumpkin at home, I prefer to use small sugar pie pumpkins. These are perfect size to yield about 2 cups of Pumpkin Puree per fruit. Roast one or 2 and no need to hoard leftover purees in refrigerator. 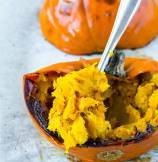 Other than this convenience, puree of home roasted pumpkins is healthier, has no thickeners, and no preservatives. It gluten free, vegan, soy free, paleo. It simply has - pumpkin fruit, salt, and oil. Pumpkin can be roasted whole or sliced into half. I prefer the later method for personal preference and opportunity to season the flesh with some oil, pepper, and salt. This makes the flesh flavorful and adds savory touch to the recipes. If you are using this recipe for a sweet dish. You can skip black pepper, and salt (if prefer). To me, salt is always needed to bring out the flavor of squash. Since Thanksgiving month is on our door steps... Season of making pumpkin pies and cookies! I thought everyone needs recipe for homemade pumpkin puree. Pumpkin Puree is the most common way to prepare roasted pumpkin. It can be used endless ways. 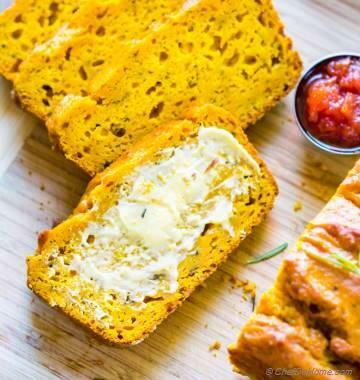 Breads, soups, sauces, cakes, pies and what not! To make puree, I scoop out flesh from freshly roasted pumpkin. Add it in jar of immersion blender or a regular blender with 1/2 cup filtered water. Water can be replaced with stock for savory recipes. Or you can use less water if recipe calls for a thicker puree. Blend it until puree is smooth and has constitency you prefer. One medium Sugar Pie Pumpkin yields about 1.5 cup to 2 cups of pumpkin puree depending upon size of pumpkin. Oh, and when I baked pumpkin for this pumpkin roast recipe, I used the fresh pumpkin puree to make some delicious pasta sauce. I will be sharing the recipe soon. Roasted Pumpkin is More Than Puree. Get Creative! A good roasted pumpkin is not just for pumpkin purees. It has delicious flavor on it's own. You can scoop out flesh with spoon and eat it as-is. Trust me, it is delicious! You can also spice-it up before baking with some cumin powder, paprika, curry powder, and lemon juice. Then roast and eat out of the shell. Or Top it with cheese and meats after baking and finish in oven. Just like you would eat an acorn squash. 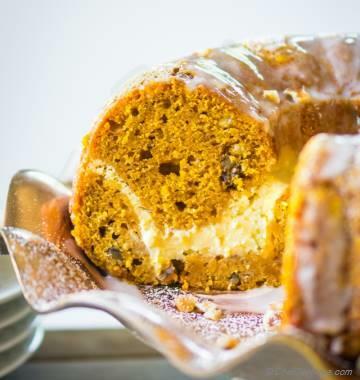 So get creative, eat more fresh pumpkin this season! This post is more of my cooking log than an actual recipe. There is just one ingredient - Pumpkin and some salt/oil for flavor. I wanted to share this with you so that I can direct you to a error-proof post on how to roast pumpkin every-time I use it in a recipe. Thanks for giving me your 20 minutes on a busy weekend. There is still one more month in Fall and Pumpkin Season. 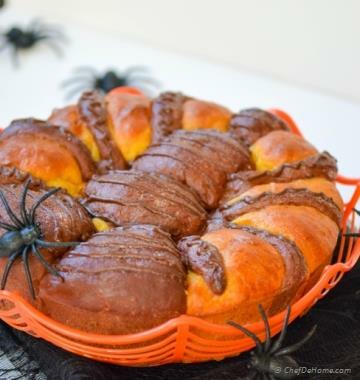 Bake some pumpkins, try some delicious fall recipes and enjoy the weekend! Total Time 50 minutes Prep Time 5 minutes Cook Time 45 minutes Difficulty Easy Yields 2 Medium Pumpkin Serves 5 Notes No. of servings depends on recipe pumpkin used for. 2. 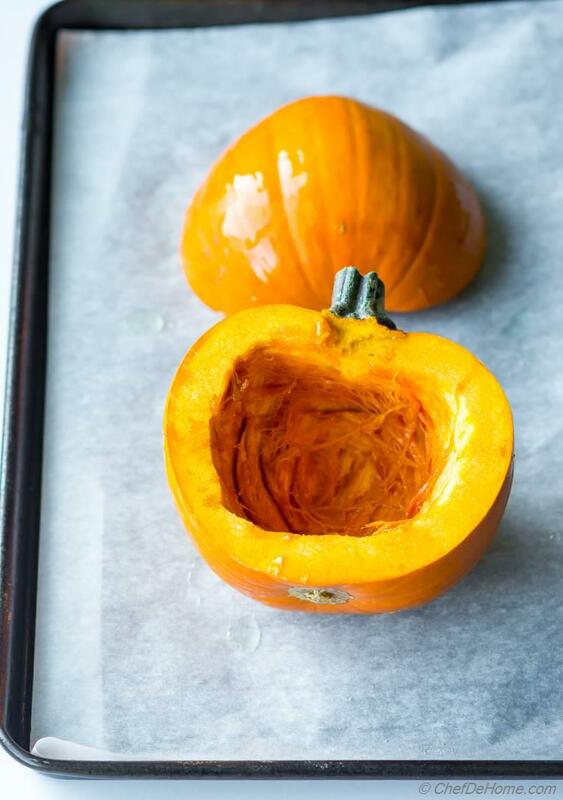 Cut pumpkin in half lengthwise. Scoop out seeds and fiber (as much as you can). Drizzle cut side with generous coat of olive oil, pinch of salt and black pepper. Thanks for sharing tips on roasting pumpkin. I was looking for this recipe.